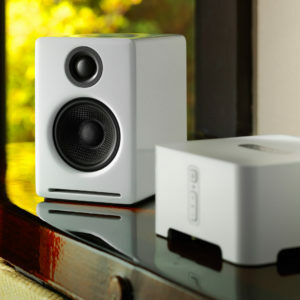 The D2 24-bit Wireless DAC allows you to stream wireless HD audio from your computer to any music system. Audioengine D2 Premium 24-bit Wireless DAC allows you to stream wireless HD audio from your computer to any music system, independent of your wifi network. D2 includes USB and optical inputs, a high-performance DAC, plus the isolation benefits of wireless. 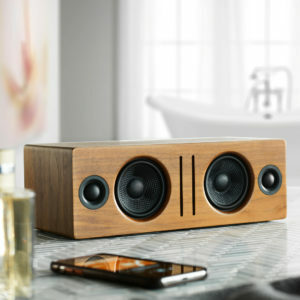 Bypass your computer’s sound card and send high-resolution wireless audio to any music system. The D2 Sender will accept USB or an optical input and the D2 Receiver will output optical or analog audio. The 100ft (30m) typical range, low latency and resistance to interference and dropouts makes D2 the best-sounding HD wireless system available. Setup is fast and simple, with no software or driver to install and without the frustration of trying to connect to your network. The D2 Wireless DAC is actually three products in one – a high-quality USB wireless computer DAC, a wireless USB-to-SPDIF converter, and a wireless digital optical-to-stereo link. 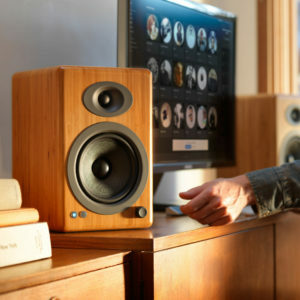 The ability to stream high-resolution audio wirelessly from your computer direct to your music system not only keeps your computer away from your audio gear, but also minimizes nagging problems such as ground loops, induced cable noise, and jitter. The D2 Wireless DAC offers audio fidelity and features of DACs costing several times more, but with one very important feature – it’s wireless! D2 is a simple to use yet powerful wireless DAC with performance and features generally found in much more expensive products. The D2 processes digital audio at any bit depth up to 24 bits and sample rates to 192KHz, then sends your music over-the-air at 24-bit/96kHz. It accepts USB or PCM optical and will automatically configure to match either of these inputs. Can I use D2 to connect my computer wirelessly to another DAC in my audio system? Absolutely! If you use the USB input of the D2 Sender, then connect the D2 Receiver optical output to your DAC and the D2 will act as a wireless 24-bit USB-to-SPDIF converter and stream high-resolution digital audio to your favorite DAC. You can also use the optical input on the D2, in which case the D2 will act as a wireless optical link to your DAC. Can I use a third-party (non-Audioengine) AC power adapter to power my D2 Sender and/or Receiver? The D2 AC power adapters have been specifically designed to provide stable low-noise power to the D2 so only use the included Audioengine power adapters. Using any other power adapter will compromise the audio quality and may damage your D2. The D2s volume control is on the sender. Does that mean it's a digital control? Will this affect audio quality? No. The volume information is transmitted via a completely separate I2C channel over the air and is used at the output of the internal DAC of the D2 Receiver to attenuate an analog output. How does D2 differ from the Audioengine W1 or W3 wireless adapters? The D2 offers bit-perfect 24/96 transmission, while the W1 and W3 wireless are 16-bit adapters (16/44.1 and 16/48KHz). Is the D2 USB isochronous or asynchronous? The D2 uses "adaptive mode" in it's USB receiver. This means that the USB receiver (Texas Instruments 1020B) will keep track of the data coming in from the computer and adjust so as not to miss any incoming data. Due to the nature of the wireless link, the data then becomes asynchronous before arriving at the Receiver. Thus the D2 acts as an asynchronous USB DAC with the added benefit of being 24/96 bit-perfect wireless. Why does D2 have a digital optical but no coax interface? We chose optical over coax inputs and outputs for D2 (and D1) primarily because TVs, Apple TV, and computers all have optical outputs. Regarding optical vs. coax quality, there are various thoughts and theories on which is better but our experience is that as long as optical is implemented correctly and the connectors are high-quality, it is essentially the same digital SPDIF signal. Can I use the D2 with an Apple iPhone or iPad? Is there a recommended "break-in period" for the D2? Your D2 will sound great out of the box and will get better over time. However, it's best to play music for 40 to 50 hours before doing any critical listening. How many wireless "zones" can I set up with D2? The D2 Sender can simultaneously broadcast to (3) D2 Receiver units. See the Pairing section in the D2 Setup Guide for pairing additional receivers. Where can I download drivers for the D2? 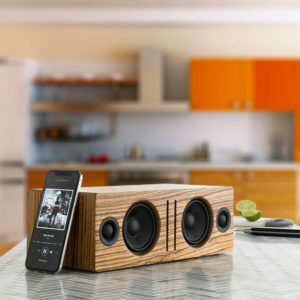 The D2 is a USB Plug-and-Play audio device. This means that the drivers it uses are developed and provided by the developer of your computer’s operating system. In the case of a Windows PC for example, these drivers are provided by Microsoft, and are a part of Windows. Will the D2 work with USB 1.1? Yes, however, note that 24/96 HD digital audio pushes the limits of USB 1.1 speeds. Due to this, it's highly recommended that you connect to a higher speed USB 2.0 port. I have the original Audioengine 5 (not the A5+ Classic), will the D1 / D2 DAC work with the inputs on that original model? You can use Audioengine DACs with your original A5s, no problem. You would simply use a standard RCA cable and the RCA to mini-jack adapter that came with the A5 to connect the RCA output from the DAC in to one of the mini-jack inputs. I'm having trouble using my D2 with Foobar in WASAPI and KS mode. What do I do? If the D2 DAC Sender is connected to my MacBook in another room do I have to go back to the computer to change songs? The free Remote app for iTunes works nicely on an iPhone/iPad and there are plenty of free apps for non-iTunes based systems as well as Android-based apps. What is the AC power cord type for Audioengine D2? What is the best USB cable length to use with D2? USB cable performance will vary with construction and length, however, for the best results we recommend using the shortest cable possible (2' or less). Will the D2 interfere with my other wireless devices? 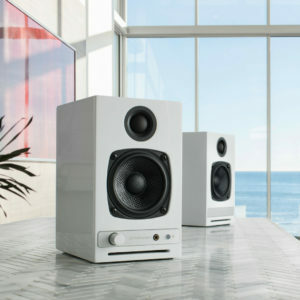 The D2 is designed to play well with most wireless devices, especially computers and routers. We do, however, recommend that you locate the D2 at least 12" from other wireless products. How do I make sure that the D2 DAC is set to 24-bit/96KHz audio? If using a Mac, open the Audio MIDI Setup utility in Applications->Utilities, choose "Audioengine D2" under audio devices and check that the format is set to 96 and the bit depth is set to 24bit. What can I do to further ensure that all my wireless devices work well together? If you use a wireless 802.11g router, set the channel to either 1 or 11. If you have a 2.4G WLAN-N access point in your home, make sure it is set to 20MHz bandwidth and not 40MHz. Can I take my D2 to another country with a different voltage? Yes, D2 uses switching power supplies so they will automatically convert to the different voltage. The AC power cord is detachable which makes it convenient to replace the AC plug with a different type if you don't want to use an adapter plug. Can I connect the D2 Sender to a USB hub? Although D2 may work just fine when connected to most USB hubs, this is not recommended as the data rate may not be fast enough for higher-resolution music. We therefore suggest you select a high-speed USB bus all by itself and don't use a USB port on your keyboard, for example.